Any consideration of Estonian theatre from the point of view of biographical theatre needs to include the work of playwright and director Merle Karusoo. Productions based on various life narratives (diaries, letters, biographical interviews) form the core of her work that can be defined as biographical or memory theatre. Her work has also been viewed within the context of community theatre or political theatre; Karusoo has herself referred to her work as sociological theatre. Life narratives have functioned in Karusoo’s productions as the basis for restoring oppressed or denied collective discourses of memory. Her productions emerged within the framework of the more general process of restoration of historical heritage and the rehabilitation of collective memory at the end of the 1980s and the beginning of the 1990s. Life story can be viewed as the essence of Merle Karusoo’s theatre. The personal in the life story in the production activates the emotional memory of the audience; for older generations such theatre facilitates a legitimisation of remembering one’s life story in entirety, and for younger generations it functions as a vehicle of collective, historical and national memory. The current article outlines the main stages of Karusoo’s biographical theatre, highlights major productions of each stage and provides an overview of their reception. Karusoo’s theatre dates back to 1980s. Productions based on life stories of the generations born in 1950s and 1960s, Meie elulood (Our Biographies) and Kui ruumid on täis ... (Full Rooms) both in 1982, mediated fragments of life stories of 16 drama students, focusing on the processes of self-conception and -reflection of young persons. In the context of the Soviet regime that exerted firm ideological control over the private lives of its citizens, Karusoo’s productions struck an especially powerful and unusual chord. Karusoo’s biographical theatre has gathered momentum and assumed a more solid shape since the end of the 1980s. Productions based on the diaries and/or letters of women--Aruanne (The Report, 1987) and Haigete laste vanemad (The Parents of Sick Children, 1988)--are mono-dramas, reflecting upon the loss of the voice and life story of an individual and the theme of historical conformism and fear brought about by the violent and hypocritical nature of the Soviet society. The next stage of Karusoo’s work focused on the “destiny years” of the Estonian nation, featuring, for example, life stories focusing on failed emigration to the West and the life experience of those executing the orders of the Soviet authorities during the 1949 deportations. Productions such as Kured läinud, kurjad ilmad (Snows of Sorrow), Sügis 1944 (Autumn 1944), both in 1997 and Küüdipoisid (The Waggoners, 1999) belong to this stage. The reception of Waggoners as a production that eroded the “us” and “them” binaries of the national community was especially polemical. In 2000, when the bilingual Save Our Souls was staged, focusing on the lives of prison inmates convicted of manslaughter and featuring both Estonian and Russian-speaking actors, marked the emergence of the theme of ethnic minorities in Estonia in Karusoo’s work. Karusoo’s biographical productions have evolved from generational life stories and the life stories of individuals to collective portraits of historically and/or socially determined groups. In 2006 Karusoo staged generation monologues Täna me ei mängi (Today We Will Not Play) and Küpsuskirjand 2005 (Essay 2005) that make visible how the semantic space of “us” and the phenomenon of “returning” the life stories to the people have assumed increasingly wider dimensions in Karusoo’s work over decades. Karusoo’s theatrical method has been compared with the work of Jerzy Grotowski and Eugenio Barba, Ariane Mnouchkine and Suzanne Osten, Anna Deavere Smith and German theatrical grouping Rimini Protokoll. Karusoo has herself emphasized that the process of self-conceptualisation needs to proceed via the story of one’s own people, and the past has to be remembered in an emotional way. Her biographical theatre has subjected life stories to artistic filtering, resulting in the enhancement of their affective resonance as well as in generalizations. Her productions have theatrically mapped an extensive share of Estonia’s life narrative and historical memory-scapes. 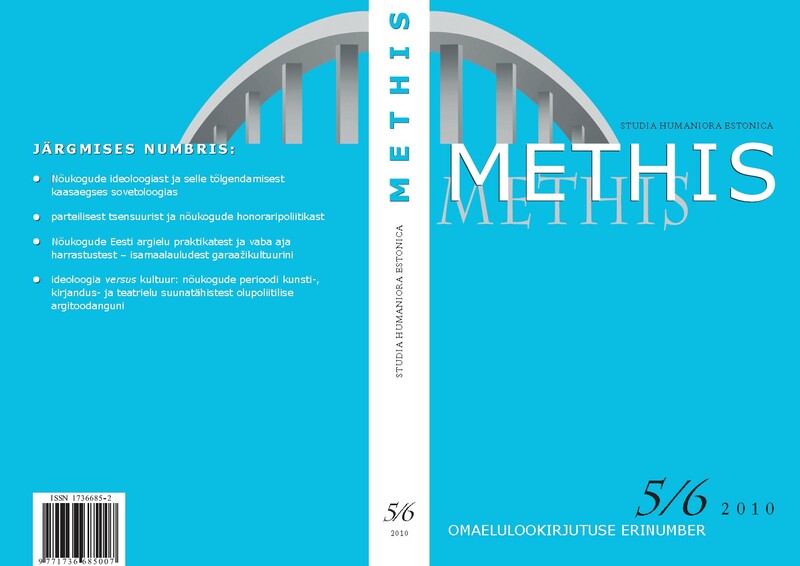 Vol 4 No 5-6 (2010): Special issue on life writing "The Role of Life Writing in Estonian Cultural History"